Academics can receive hundreds of call for papers emails every year (as you can see in the image below!). Yours will have to be catchy, neat and informative if you want them to open it. So how do you, as a chair, make your call for papers stand out from the crowd? You need people to open the mail, read it, click on your call to action, submit and eventually convert to a paid delegate. These are the challenges of what is called email marketing, which is a fairly complex field. Increase the open rate i.e. the number of people who opened your email. Make sure your email is opened! Increase the click through rate i.e. the number of recipients who click one or more links or buttons in your email. Make sure people take the actions you expect them to! Here are are three golden rules that will help you overcome these challenges. The first thing the receiver will see in their inbox is the subject line. Once they read your subject line, they’ll decide in a split-second if your email is worth opening or not. That’s why you need a strong, compelling subject line. Generic subject lines can get lost in the crowd, and may even get caught in spam folders. Make sure your subject line is clear, relevant and to the point. Summarize the email, tell the recipient what you expect from them (to submit to your conference). Include the name of your conference. Don’t make it too long. It will get cut off, and your message will not be as effective. 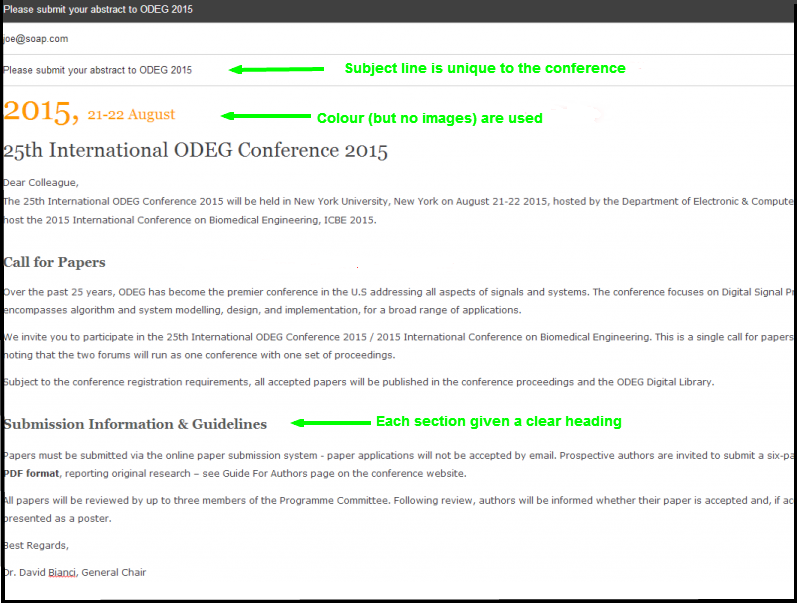 Highlight the benefits of your conference. ‘Largest Nursing Conference Call For Papers’ is more compelling than ‘Conference x Call For Papers’. You’ll likely have to send one or two reminders. If that’s the case, you can include “second announcement” or “last chance to submit” to the subject line of these reminders to entice recipients to take action. According to a study conducted by the Associated Press in 2012, adults ages 18 to 45 have an attention span of only eight seconds – just one second behind a goldfish. To encourage recipients to click on your links or buttons, you need to make your email visually attractive. A great template can do a lot for less than stellar content. And it can make a newsletter full of great content shine even brighter. Make it easy to read and find information. Format your text into headings, sub headings and paragraph text. Add some colours and enough spacing. And make sure the email contains all the relevant information. Ensure your call to actions (links or buttons) clearly stands out. Put them in a different colour and not too far down the email. Don’t rely on images too much. Some college systems have a firewall set up blocking images appearing on emails. The last thing you will want to be to a potential delegate is annoying, repetitive spam. Imagine a sales guy calling you up two or three times with the same information just nagging you to convert. You would not be too impressed! The same goes for emails. Where are you getting your list from? How do you maintain it? Build your list wisely. You can start with the list of authors and delegates who participated in your conference in the past. To make your life easier, we strongly advise using a tool to send your email. Mailchimp is a good, cost-effective option (free for less than 2,000 subscribers). This will help you manage your list of subscribers very easily. Recipients will be able to unsubscribe from the list. Duplicates will be automatically dealt with. And it will help making sure your emails aren’t marked as spam (you do not want that!). You can have different lists and send personalized email. Plus, you’ll be able to easily track open rates and click through rates and other stats to improve your emails. Summary: While these steps seem very simple, they are often not carried out effectively. By having a good subject line and appealing content (both the form and the substance) in the email to back it up, a good foundation will be in place for your CFP. If you're managing a conference check out this guide that can help you with everything from building your budget to sending your call for papers.